Thelymitra, commonly called Sun Orchids, is a genus of about 80 species of terrestrial tuberous plants in the Orchidaceae family distributed throughout Australia, New Zealand and islands to the north of Australia. They are known as “Sun Orchids” because the colorful flowers of most species only open fully on warm, sunny days, with the desert species requiring more heat than those from temperate areas. Members of the genus Thelymitra are perennial ground orchids, which die back to underground tubers during the warm dry months of the year. They have a single basal leaf and an erect inflorescence with up to 40 flowers. The flowers may be self-pollinating or insect-pollinated and open only on warm to hot days. Flowers are usually blue, pink, yellow or white, but may have darker spots or blotches or prominent longitudinal veins. The number of flowers per stem is variable. 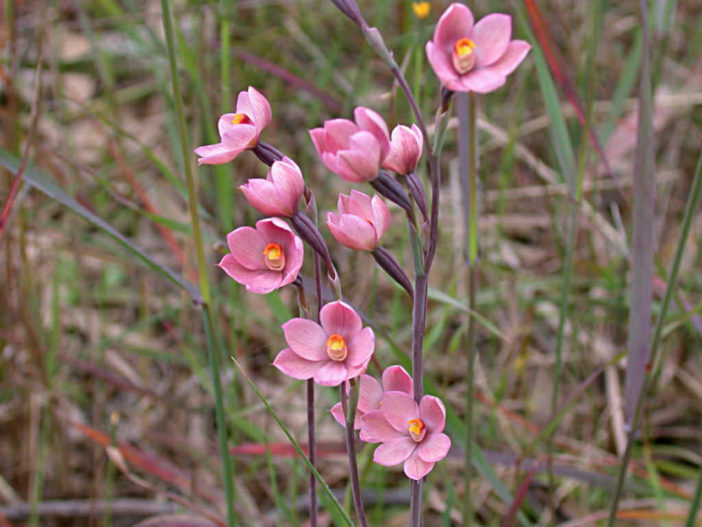 Some, such as the Scented Sun Orchid, will have up to 30 flowers open on a single stem. Unlike other Australian orchids, this genus has sepals and petals nearly equal in length, with the lip similar to and spreading with them. They have a solitary leaf that is usually elongated and channeled. Species are identified by their color and their column. Sun Orchids can be very tricky in cultivation. However, most are fairly amenable and some are very easy. All plants are summer dormant and rest as tuberoids. Plants emerge in late summer and flower in late winter, spring and early summer. Culture as sunny as possible. In milder climates garden culture is possible. Frost hardy up to 23°F (-5°C). Regular watering during the growing period is essential. Fertilize monthly until flowering. Reduce watering with the onset of flowers and stop as the leaves die back. Completely dry during dormancy. Occasionally a light spray of water for small plants and seedlings to prevent dehydration. If grown inside, move plants temporary outside in late summer as cool nights and some rain will stimulate plants into the new growing season.